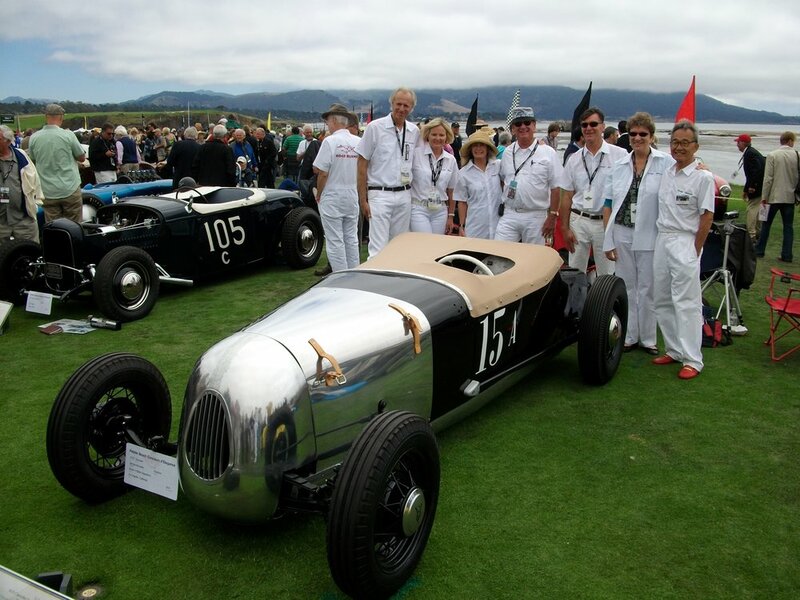 The complete restoration of the Surgin- Giovanine Roadster was completed in time for the July 12, 2009 Ventura Motorsports Gathering (a Concours Event). 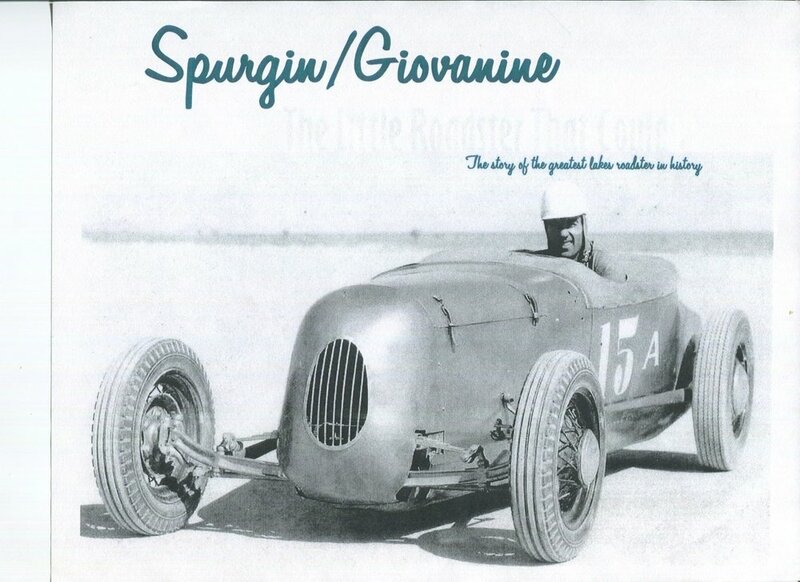 The famous and legendary Spurgin- Giovanine Roadster was raced at the SCTA Dry Lakes time trials Pre and Post WWII. We have had the S-G Roadster since 2008 and it was in a backyard in Apple Valley for over 45 years. My long time friend, David Lawrence, had discovered the still intact Spurgin- Giovanine Roadster and it had been thought that it was long lost and discovering the legendary Dry-Lakes racer was a thrill for everyone. I had the rare chance to purchase the car from him as it appeared that he would never complete the restoration of the car. 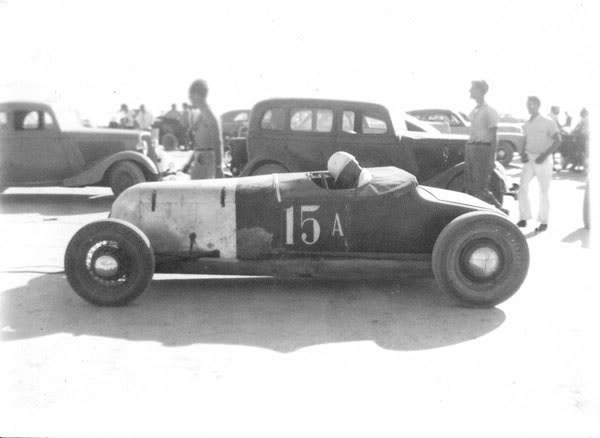 The car had raced beyond the historic 1948 SCTA racing season as a Drag racer- Dry Lakes and then Bonneville racer with a rear engine ‘Jimmy 6” motor… and then a Lions Drag Strip racer ending is lustrous racing career from 1940 to 1957. It was fortunate that the only changes were internal and on the chassis along with a solid nose and a cut out for the driver in front (motor in the cockpit). Chuck Spurgin and Bob Giovanine were brilliant and innovative together as a winning team and members of the Albata Club. It is our mission and goal to be historically correct in the restoration and we will make every effort to pay proper “Tribute” to the famous Dry Lakes record breaking race car and to Chuck Spurgin and Bob Giovanine as well as to some of the most legendary names in racing such as Hallock and Rufi. The legendary Spurgin- Giovanine Roadster was a beautifully designed Dry Lakes racer by the team of Chuck Spurgin and Bob Giovanine. The racer was a Chevy-four roadster and it was the “high points” car in SCTA competition for 1948 Season setting an A class roadster record of 123.655 mph, a record that stood for two years. During the record breaking S.C.T.A. 1948 racing season, in which it was defying all incredible odds, as the October 30-31, 1948 S.C.T.A. Racing News Program had a story on the roadster titled… “Will the Chevy Four make a clean sweep?” At that time the Spurgin- Giovanine Roadster was breaking the World Class record at every consecutive S.C.T.A. meet during the entire season as well as the leader in total points up to that time over the entire association competition. The sleek swift Roadster did accomplish the impossible and completed a perfect season with a first place in Class A at each meet, as it accomplished the incredible feat of Land Speed history as it broke the World Class record at each SCTA meet of the 1948 season, and was the ultimate High Points” SCTA race car with an incredible 1800 points for the proud Albata Club racer. The Spurgin- Giovanine Roadster was the “Cover Car” for the Hot Rod Magazine in March 1949 and the “Hot Rod of the Month” with a feature article. The Spurgin- Giovanine Roadster was the feature car at the 2nd Annual Hot Rod Exposition in 1949. The Spurgin- Giovanine Roadster had the great innovative support from the key members of the famed Albata Club and Rufi and Hallock brought the very best in innovative modifications to the Spurgin Giovanine Roadster as it was a team effort to accomplish such a feat in 1948. The Spurgin- Govanne Roadster was taken over by Carl Borgh of Harbor City of Southern California in 1954. The Spurgin- Giovanine Roadster subsequently continued racing in a modified configuration as the “Mothersill’s Special” that raced at Bonneville in October 1956. The new owner, Carl Borgh changed out the engine with a 292- cubic inch GMC, using the same Spurgin- Givonine Roadster chassis and turning a 141 mph. Racing included many Drag Racing events for the car. The Borgh- “Mothersills Special” in 1955 made the change as the engine was moved to the rear and the car turned 149 mph at Bonneville. It was again a feature car in the Hot Rod Magazine in the second configuration. It was sold to Robert Cano of Harbor City California and pictured in the 1956 Hot Rod Annual. Robert Cano raced the car at the Lion’s Drag Strip in Long Beach and the car was known as the “Snoot” as per magazine articles. It was lucky for us that the body and rolling chassis was totally intact after all the years…and welding markings that showed the changes that were made over the years of racing as the changes were internal to the original body and on the chassis only. We have been able to complete the project with help from respected historians of the Dry Lakes Racing, friends… and good networking team. Richard Parks who is the son of the legendary Wally Parks that helped start the National Hot Rod Association and the SCTA, is one of the most respected historians of Dry Lakes – Land Speed Racing… as he stated that he thought there was a special category of the four of the most famous and significant Land Speed Historic race cars…which include the Pre- WWII Rufi Streamliner and Schenck Streamliner and Post WWII Spurgin-Giovanine Roadster and the Chrisman #25 Dragster. The Spurgin-Giovanine Roadster did secure the most coveted invitation to be presented at the Pebble Beach Concours d’Elegance in the category of Legendary Land Speed Race Cars. 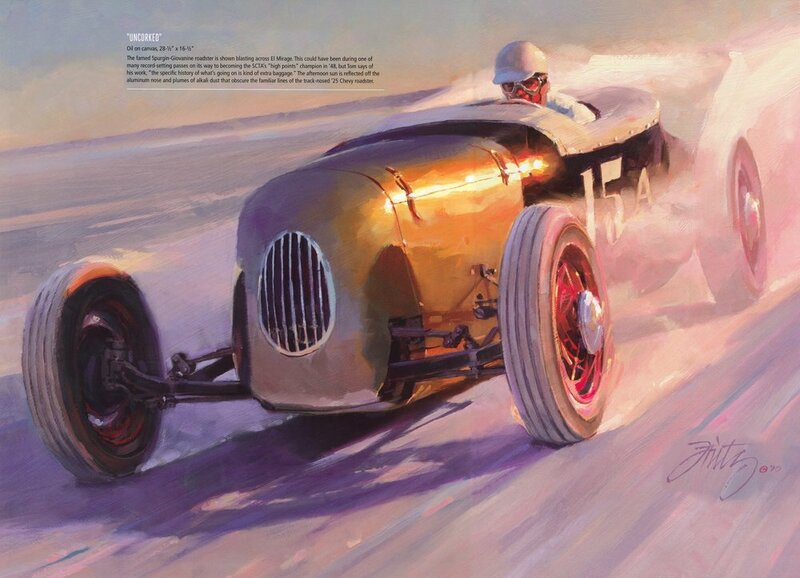 Richard Parks helped provide a 12,000 word story in the Special 100th Edition of the Newletter for the Society of Land Speed Historians which was solely dedicated to the Spurgin- Giovanine Roadster recently as it documented the entire history of the legendary Dry Lakes Champion. It is a historic Land Speed race car treasure indeed… and it is a great responsibility for our team to preserve the great historic legacy of the Spurgin- Giovanine Roadster as best as we can. It was lucky for us that the body and rolling chassis was totally intact after all the years…and welding markings that showed the changes that were made over the years of racing as the changes were internal to the original body and on the chassis only. We have been able to complete the project with help from respected historians of the Dry Lakes Racing, friends… and good networking team. Richard Parks who is the son of the legendary Wally Parks that helped start the National Hot Rod Association and the SCTA, is one of the most respected historians of Dry Lakes – Land Speed Racing… as he stated that he thought there was a special category of the four of the most famous and significant Land Speed Historic race cars…which include the Pre- WWII Rufi Streamliner and Schenck Streamliner and Post WWII Spurgin-Giovanine Roadster and the Chrisman #25 Dragster. The Spurgin-Giovanine Roadster did secure the most coveted invitation to be presented at the Pebble Beach Concours d’Elegance in the category of Legendary Land Speed Race Cars. Richard Parks helped provide a 12,000 word story in the Special 100th Edition of the Newletter for the Society of Land Speed Historians which was solely dedicated to the Spurgin- Giovanine Roadster recently as it documented the entire history of the legendary Dry Lakes Champion. 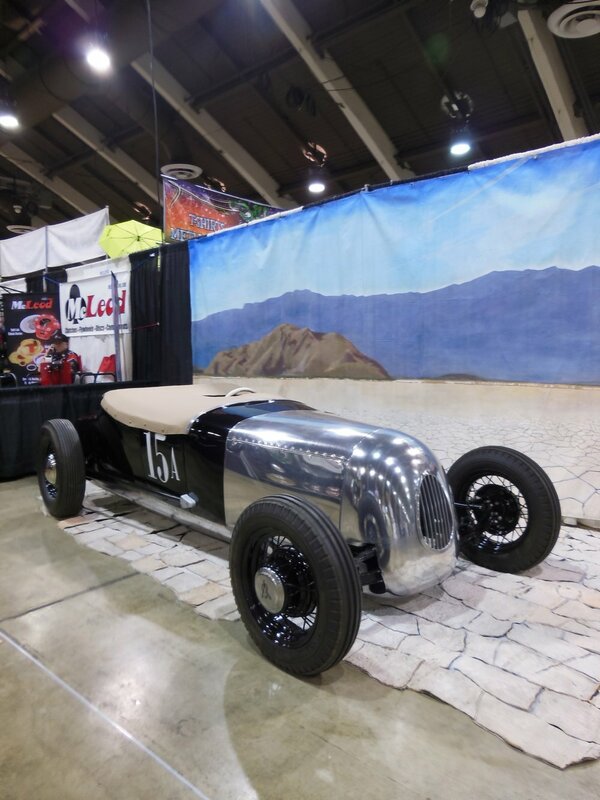 The Spurgin Giovanine was showcased at the Grand National Roadster show at which time it won the class trophy. 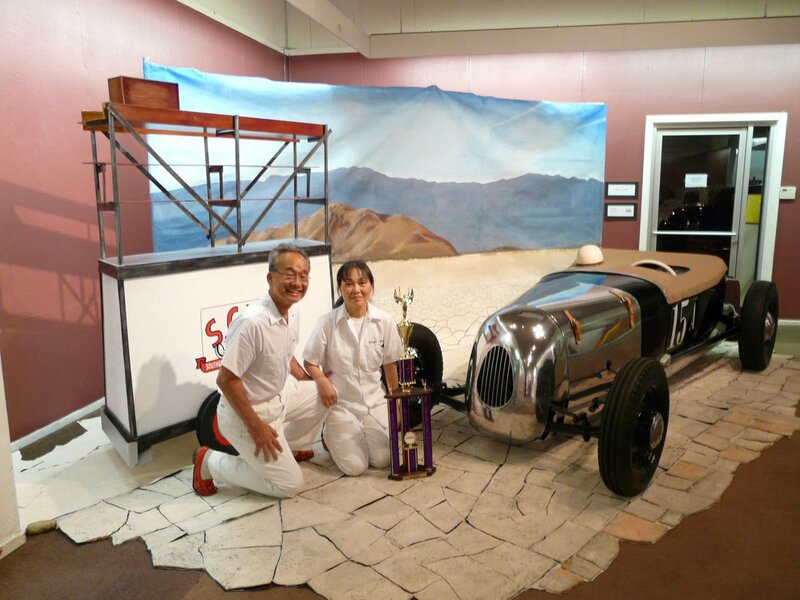 The Spurgin Giovanine was the trophy winner also at the Palos Verdes Concours d'Elegance and the Dana Point Concours d'Elegance events/ It is a historic Land Speed race car treasure indeed… and it is a great responsibility for our team to preserve the great historic legacy of the Spurgin- Giovanine Roadster as best as we can. Spurgin Giovanine Roadster 2015 Hall of Fame Induction into Dry Lakes Hall of Fame produced by talented Justin Miller.